The much anticipated meeting of two of the highest government officials in the country finally happened. President Rodrigo Duterte and Vice-President Leni Robredo met during a ceremony for the new Armed Forces of the Philippines (AFP) Chief of Staff Ricardo Visaya at Camp Aguinaldo last July 1. It was the first time that the two met personally since they won the election. They are known for having a cold relationship as they are both from rival political parties. Duterte is from PDP- Laban while Robredo is from Liberal Party. Duterte previously decided not to appoint Robredo to any cabinet position to avoid wrenching Sen. BongBong Marcos’ feelings who lost to Robredo in the election. The two had a separate inauguration ceremonies when they took their oath. The president held his oath taking at the Malacanang Palace while the Vice-president’s own ceremony was held at the Quezon City Reception Hall. 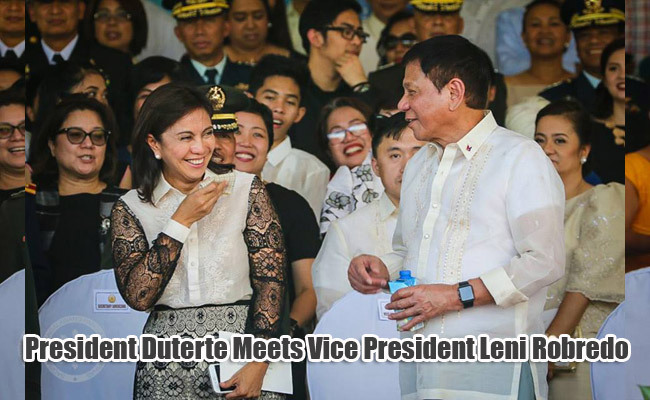 President Duterte acknowledged Vice- President Robredo’s presence at the start of his speech and jokingly said that he preferred to sit beside her but Secretary for Defense Delfin Lorenzana was seated between them. The audiences at the event were fascinated with Duterte’s gesture. Robredo was interviewed by the media after her encounter with Duterte and she describes it as a friendly meeting. She also revealed that she asked the president’s permission to have a courtesy call and Duterte agreed. Once she return to her office, the vice-president will set up a schedule to have a meeting with the president. Meanwhile, Duterte emphasized on his speech that his first job is to have peace in our land rather than war. He plans to visit Nur Misuari in Sulu who is a chairman of Moro National Liberation Front. He also wants to talk with the terrorist group, Abu Sayyaf but it’s not on his priority right now. Duterte then warned the drug lords that are currently jailed at the National Bilibid Prison.